Nearly a dozen UC Berkeley faculty members will play key roles in four multi-university research projects funded this year by the UC Office of the President to catalyze interactions across the 10-campus system. 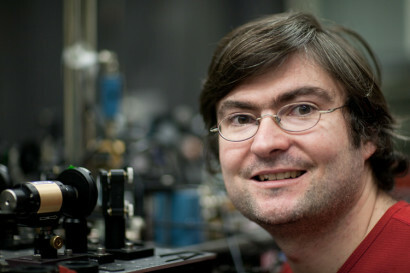 Physicist Holger Müller will lead a three-campus project to detect mysterious dark matter. One of the projects will be led by UC Berkeley physicist Holger Müller, who received $300,000 over two years to expand a search for dark matter, mysterious particles that have yet to be seen but which make up 85 percent of the matter and a quarter of all the energy in the universe. As part of the “Network of Sensors for Exotic Physics” project, UC Berkeley, UC Santa Barbara and UCLA physicists will employ sensitive probes to search for ultra-light subatomic particles believed to constitute dark matter, in hopes of identifying the basic building blocks of the universe. UC Berkeley physicist Dima Budker is the co-principal investigator for the project. The 2016 President’s Research Catalyst Awards, chosen from a pool of more than 180 proposed projects, were announced Dec. 7 by UC President Janet Napolitano..
Napolitano launched the President’s Research Catalyst Awards in December 2014. The program channels $10 million over three years to fund research in areas of strategic importance, such as sustainability and climate, equity and social justice, health care and basic discovery. To qualify, projects must be multi-campus, multidisciplinary efforts that offer research, teaching and learning opportunities for undergraduate and graduate students. This year, applicants were also asked to incorporate public engagement and faculty mentorship components into the projects. The four 2016 awards, totaling over $4.8 million, focus on protecting biodiversity. enhancing agricultural resilience in times of drought and preserving cultural heritage sites in the Middle East, as well as the detection of dark matter. $1.76 million over three years for a Conservation Genomics Network, led by UCLA and involving UC Berkeley’s Rasmus Nielsen as co-principal investigator and Michael Nachman, Steven Beissinger and Erica Rosenblum as co-investigators. The goal is to develop a revolutionary bioinformatics toolkit to understand changes in gene expression and how threatened populations respond to changes in their habitats and in the climate. $1.69 million over three years for a Consortium for Drought and Carbon Management, led by UC Riverside and involving Eoin Brodie of UC Berkeley and Peter Nico of Berkeley Lab as co-principal investigators and Berkeley Lab scientists Margaret Torn and William Riley as co-investigators. The group plans to leverage cutting-edge research on the soil microbiome to estimate how crops like tomatoes and alfalfa respond to drought under various farming practices and irrigation methods. $1.07 million over two years for a project titled “At-Risk Cultural Heritage and the Digital Humanities,” led by UC San Diego and involving UC Berkeley’s Benjamin Porter as co-principal investigator. The four-campus collaboration will conduct archaeological research covering more than 10,000 years of culture and architecture in Egypt, Turkey, Jordan, Greece and Cyprus using 3D archaeological data to study, forecast and model the effects of human conflict, climate change, natural disasters and technological and cultural changes on these sites and landscapes. More information on the program is available on UCRI’s Catalyst website. Additional detail regarding these awards is available in the 2016 Awards List.